[Northern Colorado Beer News] - Time to celebrate a Colorado Summer weekend! There are a couple festivals this weekend in Larimer county that you'll want to check out. Plenty of live entertainment tonight in local taprooms with some awesome food trucks too. New releases and anniversary parties. Lots to do in NOCO this weekend! Here's what's happening around the Northern Colorado craft beer scene today, Friday, June 24th, 2016. If you aren't reading this article on FermentedlyChallenged.com, you don't know what you're missing. Be sure to follow Fermentedly Challenged on Facebook too. 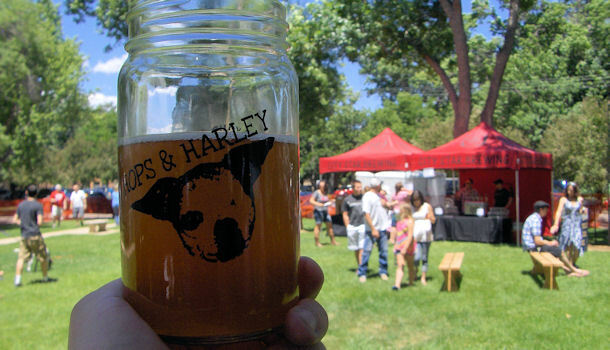 Picture of the Day comes from: Hops & Harley - Fickel Park - Berthoud, CO.
300 Suns Brewing is participating to today's Southend Downtown Block Party from 3pm to 7pm. The party is extending into their parking lot tonight with a free concert from the Air National Guard Band of the Southwest from 3:30pm to 4:30pm, then Dueling Ukes from 5-6:30pm. Plus, there will be Georgia Boys BBQ on hand, face painting, root beer and craft beer ice cream floats, and the release of 300 Suns new house make "Tilly's Root Beer" and "Aunt Sonny's Hard Root Beer". Extra parking is available just northeast of the brwwery on Emery. Located at: 335 1st Avenue, Unit C, Longmont, CO. Crystal Springs Brewing Company just started delivery of their Naughty Marilyn Belgian Style Ale in cans to local stores. Look for Naughty Marilyn around the Boulder County area. Taproom open today from 12pm to 9pm. Located at: 657 S Taylor Avenue, Unit E, Louisville, CO.
Großen Bart Brewery is hosting live music tonight with The Prairie Scholars tonight from 6-8pm. Plus food tonight from Racheli's Italian Restaurant. Plenty of beer to go around tonight. Located at: 1025 Delaware Avenue, Longmont, CO. Liquid Mechanics Brewing Company is in the process of expanding into a new tasting room. The finishing touches are going in now including a wood covered wall. Set up open up on July 1st! Today they have 15 beers on tap including their Hananero Imperial IPA (going fast). Located at: 297 N US Hwy 287, Lafayette, CO.
Oskar Blues Grill & Brew has great O.B. beer, food and live music all weekend long. Tonight - Watertower Music from 9pm to 12am. Saturday is Merle Haggard Tribute Night (aka Hagfest) from 9pm to 12am, and on Sunday music from Steve Itterly with Sliden Delta 5pm to 8pm. Located at: 303 Main Street, Lyons, CO. Twisted Pine Brewing Company - Today in the taproom, Twisted Pine is doing another Pints With A Purpose event. They'll give $1 from every pint sold to Brave Young Hearts, an organization who helps support children with life-threatening illnesses. Located at: 3201 Walnut Street, Boulder, CO.
Upslope Brewing Company brewed up a special beer today, a Cherrywood Saison. The brew was made with actual pieces of cherry wood from a tree in the Founder's own yard. It'll debut in the Flatiron taproom sometime next month - stay tuned! Located at: 1898 S Flatiron Court, Boulder, CO. Very Nice Brewing Company is hosting live music tonight from jazz duo Bruce Lish & George Stone tonight in the taproom from 6pm to 8pm. Chill out with a beer and some cool jazz. Located at: 20 Lakeview Drive, Unit 112, Nederland, CO. Vindication Brewing Company is celebrating their 3rd Anniversary tonight! They will be celebrating with great beers, wood-fired pizza, and music from Idlewhile tonight. Then all day tomorrow, Saturday June 25th, you can get $4 off growler fills and $5.50 core bombers. Plus $1 off six-packs to go. Located at: 6880 Winchester Circle, Unit F, Boulder, CO. Vision Quest Brewery is planning to release a bunch of new beers tomorrow, June 25th starting at 3pm. New beers include: Coffee Chocolate Rye Brown, Tangerine Wheat, Juicy Hot Habanero Wheat, White IPA, Coconut IPA, Belgian Blonde Braggot w/guava, and a Berliner Weiss with mango & passionfruit. Plus 5 other special beers including some SMASH brews (single malt and single hop). Plus there'll be plenty of food for the event as well. Located at: 2510 47th Street, Unit A2, Boulder, CO.
Walnut Brewery - Set your calendars for Thursday, July 14th for the tapping of their Double Down Double IPA at 6pm. Starting that day and for the next 4 weeks, they will give 50 cents of every pint of that beer sold to Boulder's Rocky Mountain Rescue Group. Located at: 1123 Walnut Street, Boulder, CO.
Wibby Brewing is part of the South End Block Party tonight. Part of their Summer Concert Series, Wibby is hosting My Blue Sky, an Allman Brothers Tribute Band tonight from 9:30pm to 10:30pm. Food truck on site at 3:30pm today too. Located at: 209 Emery Street, Longmont, CO.
Berthoud Brewing Company - You can get a brat and sides with your beer tonight. Stay and listen to live music from Brian Wallen starting at 6pm tonight. Located at: 450 S 8th Street, Berthoud, CO.
Big Thompson Brewery offers a free pint today to anyone who buys some Big Thompson apparel. Stock up! Located at: 114 E 15th Street, Loveland, CO.
Black Bottle Brewery is doing a mini-tap takeover tonight for two breweries: Oskar Blues and Perrin Brewing Company. Each with have 4 guest taps tonight starting at 6pm. Check 'em out! Located at: 1611 S College Avenue, Ste 1609, Fort Collins, CO.
Buckhorn Brewers has changed their business hours slightly. For the time being, they will no longer be open on Wednesdays. So get over there Thursday through Sundays for the future. Located at: 4229 W Eisenhower Blvd, Loveland, CO.
City Star Brewing reminds you that Hops and Harley is tomorrow 6/25 from 11am-6pm! Rescue your thirst for National Mill Dog Rescue in a celebration of dogs and craft beer. Bring a lawn chair or picnic blanket and enjoy the day in Berthoud's beautiful Fickel Park. Live music with Western Skyline and Daniella Katzir feat members of Eufórquestra, food trucks, City Star beer tent, vendors, dog agility course, Doggy Doppelgänger Contest, Craft Yoga with Brie, Crafty Sniffers Nose Work Demo, Brewery Dogs Beer Tasting at Hops and Harley, Wee Casa Tiny Home and more! Visit www.hopsandharley.com for all the details. Taproom located at: 321 Mountain Avenue, Berthoud, CO. Climb Hard Cider Company is releasing their new Perry today. It's a fermented pear juice sipper perfect for summertime. Available in pints, 32oz & 64oz growlers. Located at: 2707 W Eisenhower Blvd, Unit 3, Loveland, CO.
Equinox Brewing has live music all weekend long. Sunday marks the release of their special collaboration brew they did with musical group Switchman Sleeping called Switchman Session IPA. Located at: 133 Remington Street, Fort Collins, CO.
Funkwerks is hosting a beer release tomorrow starting at 11am for their 2016 Saison - aged in red wine barrels. They aged their award winning Saison in wine barrels for a smooth oak finish and an amplified fruit character. Available in bottles and on tap. Located at: 1900 E Lincoln Avenue, Fort Collins, CO.
Grimm Brothers Brewhouse has a taste treat for you tonight - a new firkin! Tonight's firkin is a beetle-juice cocktail Snow Drop. This version of Snow Drop has a lot of fruit flavor. Enjoy! Located at: 623 Denver Avenue, Loveland, CO. Horse & Dragon Brewing Company created two special firkin variations of their Sad Panda Coffee Stout. One is a hazelnut called Nutty Panda, and the other was made with cherries and chocolate called Ch-Ch Panda. However, you can only get this over at Dungeons & Drafts (1624 S Lemay Ave) in Fort Collins this weekend for their 1st Anniversary party. The Hazelnut taps at 6pm tonight and the CH-CHA Panda taps Saturday at 6pm. Meanwhile, regular Sad Panda is on tap at H&D. Located at: 124 Racquette Drive, Fort Collins, CO.
Loveland Aleworks - Tickets are going fast for the upcoming 4th Anniversary Fest of Ale 2016 set for Sunday, July 3rd from 4pm to 10pm at the brewery. Get yours in the taproom or online at: festofale4.bpt.me. They have five diverse styles of seasonal beers on tap right now for their summer lineup. Stop in for a pint or get a taster flight of your choice. It's perfect for enjoying on a summer evening on the patio. Located at: 118 W 4th Street, Loveland, CO.
Maxline Brewing just tapped a new Imperial Brown Ale today. It's a hefty 8% ABV & 64 IBU deep mahagany brew. Stop in for a glass. Located at: 2701 S College Avenue, Unit 190, Fort Collins, CO.
Rock Cut Brewing Company just put up their Pale Ale back on tap. This batch was made with a Calypso Single Hop recipe. Enjoy one out on their riverside patio and soak up some sun today. Located at: 390 W Riverside Drive, Estes Park, CO.
Scrumpy's Hard Cider Bar has a deal for you mead lovers out there. Get any 6oz pour of their available mead from their bottle stock for just $5 until the bottles are all gone! If you've never tried mead before, this would be a great deal to get you introduced to it! Also, plenty of house and guest hard ciders on tap too. Located at: 215 N College Avenue, Fort Collins, CO.
Snowbank Brewing Company has a deal to get a free beer, but to get it you'll need to put your hiking shoes on and work for it. Take a picture of yourself on top of Horsetooth Rock or Grey Rock and tag them on social media with it and let them know - then you'll earn your 1st pint on the house! Tonight at 5pm in the taproom, they will be releasing a new specialty beer of the week - a Grapefruit Open Source IPA - made with grapefruit zest. Taproom open today from noon to 9pm. Located at: 225 N Lemay Ave, Ste 1, Fort Collins, CO.
Three Four Beer Company may not be a brewery yet, but they're working on it soon. In the meantime, they're offering up a social media only special. You can get an Oskar Blues Pinner IPA for just $2 next week from Monday through Thursday 11am to 6pm. Just mention you saw this deal on social media. Plans are underway to brew their own beers in the near future. Located at: 829 S Shields Street #100, Fort Collins, CO.
Verboten Brewing & Barrel Project is having a beer release today featuring a big Scottish ale called "Get In My Belly". It's a very malty summer heavy brew. A portion of this beer was aged in a bourbon barrel for a wee bit of extra flavor. Try one! Located at: 127 E 5th Street, Loveland, CO.
Zwei Brewing offers a weekly Maß Monday Special from 6pm to 9pm. Get $3 off your Zwei beer if you buy it in their Maß sized glass. Then on Tuesdays they offer a growler countdown special. From 1pm to 2pm get $3 off growler fills. Then from 2pm to 3pm get $2 off growler fills. And from 3pm to 4pm you get $1 off growler fills. After that - it's full price again - so get there early! Located at: 4612 S Mason Street, Ste 120, Fort Collins, CO.
Brix Taphouse & Brewery offers teachers a special deal every Friday this month. Teachers get $1 off food and drinks from 5pm to 7pm. Then on Saturdays it's Flight Night with special prices on beer flights. Over 60 Colorado craft beers and hard ciders on tap including their own popular brew "Brix Bikini Bottom Pineapple Wheat". Located at: 813 8th Street, Greeley, CO. Broken Plow Brewery has their tap lines full and ready for the weekend. You'll want to stop in on Saturday night around 7, that's when a great band called "South to Cedars" will be performing. A mix of acoustic Americana, folk, bluegrass and rock. Get there early for a good seat. Located at: 4731 W 10th Street, Unit G, Greeley, CO.
Crabtree Brewing Company has a special firkin tapping most every Friday at 6pm. Stop in to see what's being tapped this week. Plus, join in the fun on Saturday nights for Greeley Game Night from 7pm to 12am. Join the Northern Colorado Boardgames Meetup Group and play some awesome boardgames and party games - hosted by Amy and Lane. Located at: 2961 29th Street, Greeley, CO.
High Hops Brewery is the place to be every weekend in the summer for outdoor patio fun, live music, great food trucks and great views of the mountains. Full line-up of live music this weekend including: Whitherward (Fri 6pm), Sista Otis (Sat 5pm) and Bo DePena (Sun 3pm). Try one of their 9 regular brews or ask to try one of their rotating seasonal beers. Located at: 6461 Hwy 392, Windsor, CO.
WeldWerks Brewing Company has live music lined up for Friday and Saturday night. Enjoy a beer and listen in to "Mostly Joe Hawkins" on Friday from 7-9pm. Food truck will be there by 4pm. Then on Saturday night from 8pm to 10pm listen to Sista Otis. Food truck on site from 5-9pm that night. Stop in and try one of there many beers on tap including the popular Juicy Bits New England-style IPA - available on tap and once again in crowlers (today only limit 1 per person)! Located at: 508 8th Avenue, Greeley, CO.
Colorado Brewers' Festival is happening this weekend in downtown Fort Collins Colorado on June 25 & 26. 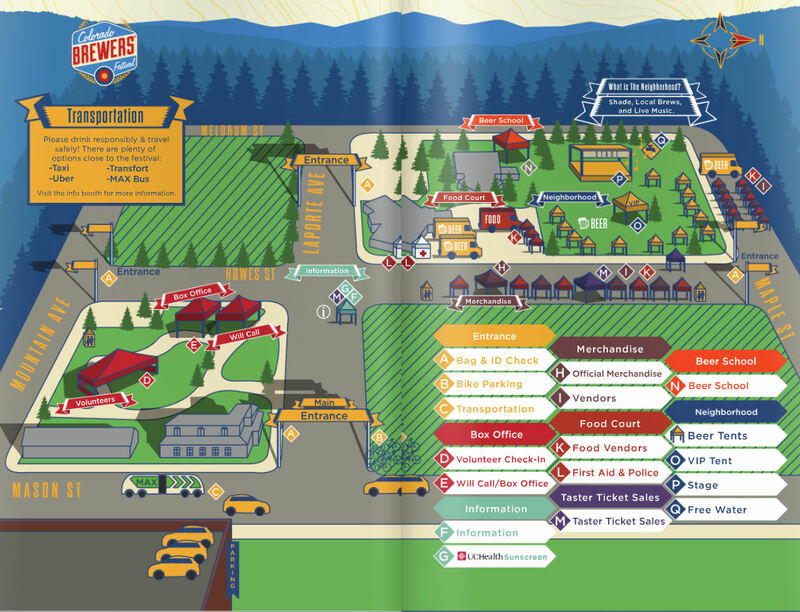 Here's map of the festival. Discount ticket packages available at many Fort Collins brewery taprooms through tonight. More info at the Downtown Fort Collins website. Click map to enlarge. 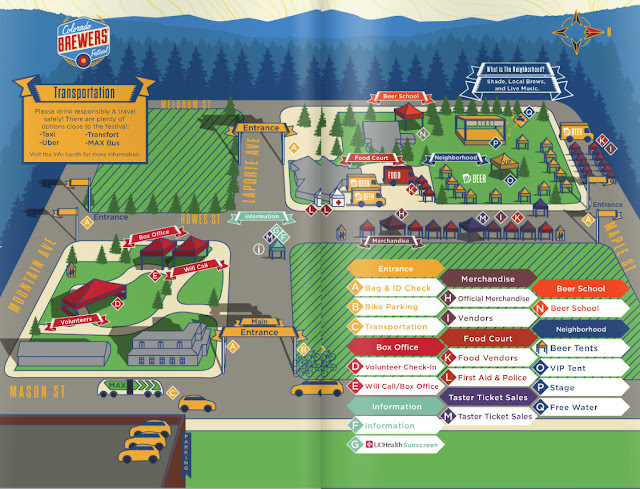 View Northern Colorado Brewery Maps - Find a brewery near you!